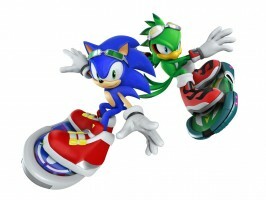 Today, Sega added to its promotion roster for Sonic Free Riders by opening a website portal dedicated to the Kinect exclusive, and reaffirming what we’ve been telling you for months: The game will ship as a Kinect launch title, November 4th in North America, and November 10th in Europe. The portal itself, at this point, affords very little new information or even new screenshots and video–those are coming soon, though if programmed similar to the ASR portal earlier this year, perhaps sooner than later. Already, some data mining has taken place in the form of music releases and character art. Courtesy of Woun, those pieces of character art and music are available in the gallery below. Also available, an artistic peek at some of the lesser known stages to this point, including a Ruins stage and an ice level previously seen in older screenshots. Music is available here, here and here. We thank him for sending us the tip. If you have news to share, be sure to share it with us by clicking News Tips at the top of every page.